A - Top to Center of Hole: 1-5/8"
B - Overall Height: 2-3/16"
E - Hanger Width: 2-3/4"
F - Bolt Diameter: 9/16"
Trailer spring hangers secure the leaf spring to the frame of your trailer. Trailer spring hangers are sold separately do not include mounting hardware or bolts. 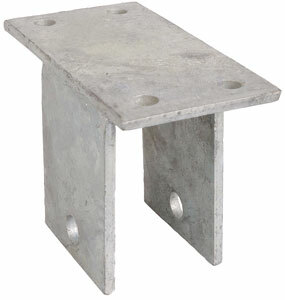 This spring hanger is a universal bolt on style hanger for a double eye spring and the finish is Galvanized. This FSHG spring hanger is designed to be bolted on and is typically used for the double eye leaf springs.